Walker, who spent 16 years with the organisation and was a leading figure in the think tank, dies peacefully after long illness. Ernie Walker, former Scottish Football Association secretary, has died. He enjoyed watching Scotland compete in five consecutive major championship finals, from the 1974 World Cup in West Germany to Italia 90. He was one of the leading figures in the Think Tank, a root-and-branch review of Scottish football undertaken with the help of the Dutch coaching legend, Rinus Michels. 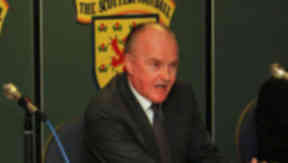 The SFA website read: "It is with sadness that the Scottish FA has learned of the death of its former secretary, Ernie Walker. "George Peat, the Scottish FA president, paid tribute to an administrator whose knowledge of the game was respected throughout world football. He was chairman of UEFA’s Stadia Committee for more than a decade, co-authoring reference books in this area, and was an advisor on many other aspects of the game. “On behalf of the Scottish FA I would like to convey by condolences to the Walker family,” said Peat. “Ernie was renowned throughout the game as a first-class administrator and a first-class gentleman. Indeed, one of the first people to contact me upon hearing the news was Theodore Theodoridis, UEFA’s Deputy General Secretary. “It is a tragedy that we have lost Ernie and his successor, Jim Farry, in recent months; two men who presided over a golden era for Scottish football and the national team. “Ernie was renowned for his negotiation skills and his impact on the Scottish FA and the game in this country continues to be felt. It is symbolic that Ernie’s passing has coincided with another review of Scottish football, conducted by Henry McLeish.